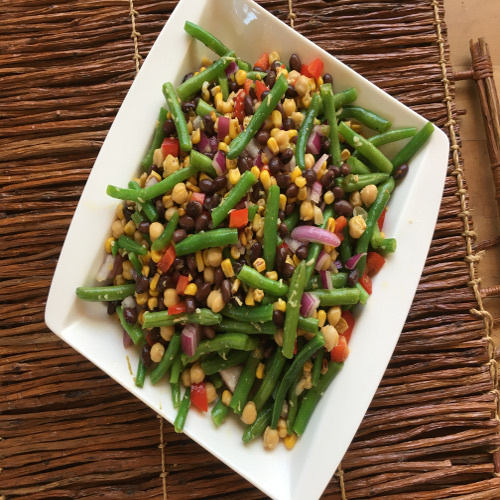 This salad has nutrition galore and makes a great side salad or buffet dish. Often I’ll add some grilled chicken or fish and make it a main meal. Cut the avocado just before serving, or add some lemon juice to it to prevent discoloration. 2. Spray a small non-stick skillet with cooking oil and place over medium heat. Sauté the corn, stirring frequently, until browned, approximately 8 minutes. Add to the serving bowl, along with the black beans, chickpeas, bell pepper, onion and avocado. 4. Pour the dressing over the salad and toss to mix well. Garnish with the cilantro.